We Made Too Much Upload!! Nothing for me today in We Made Too Much but I do recommend the Transformation Wrap in Dune if you don’t already have it and where considering it. 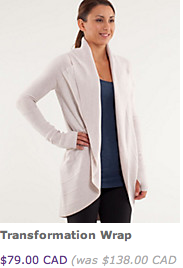 I quite love this sweater in this color and find Dune a very versatile neutral. I’m a size 10 and occasional 8 but I went for the 8 in this and it’s plenty roomy for me, the lapels overlap nicely when I pull the jacket closed and tie the cinch cords. The markdown price is more than a few dollars too which is surprising.